Genea-Musings: Treasure Chest Thursday - Post 314: Birth Records of Children of Ephraim and Abigail (Stone) Sawtell in Groton, Mass. 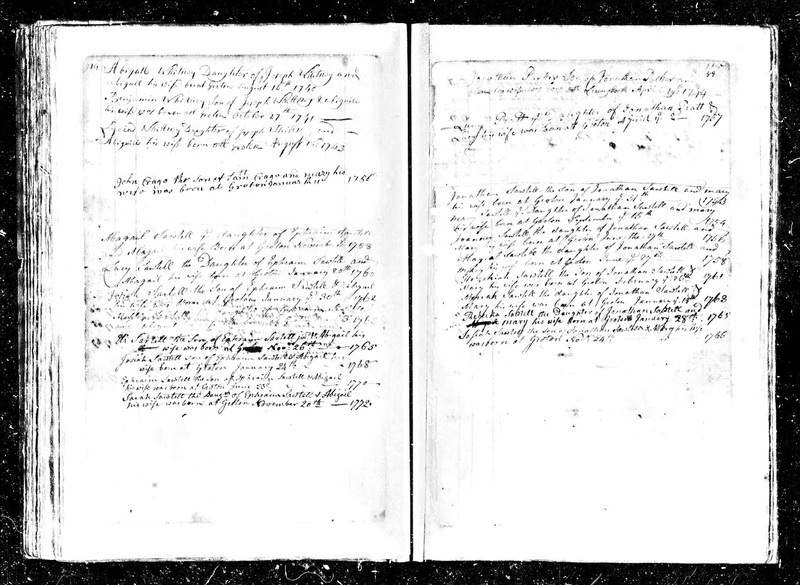 Treasure Chest Thursday - Post 314: Birth Records of Children of Ephraim and Abigail (Stone) Sawtell in Groton, Mass. Massachusetts, Town and Vital Records, 1620-1988, digital images, Ancestry.com (http://www.ancestry.com : accessed 19 May 2016), "Groton, Births, Marriages, and Deaths," image 86 of 990, births of children of Josiah and Abigail Sawtell; citing original data from Massachusetts town and city clerk records in Jay and Delene Holbrook, Massachusetts Vital and Town Records (Provo, Utah : Holbrook Research Institute), Microfiche collection. These are the first eight of ten children born to Ephraim and Abigail (Stone) Sawtell; the last two children were born in Mason, New Hampshire. The surname varies between Sawtell and Sartell in these records, presumably spelled as the town clerk heard the names. Note that there are two children born with the name of Josiah. The first one was born in 1762 and died in 1766. Ephraim and Abigail (Stone) Sawtell are my 5th great-grandparents. Their son and 6th child, Josiah Sawtell (1768-1847) is my 4th great-grandfather. Randy, your ancestors keep either showing up in the same place as mine or they are the same people. I need some Baileys in Peacham, Groton, VT. Have any?